There are quite literally hundreds of different sour beers that have been released by different breweries over the course of the last year or so. 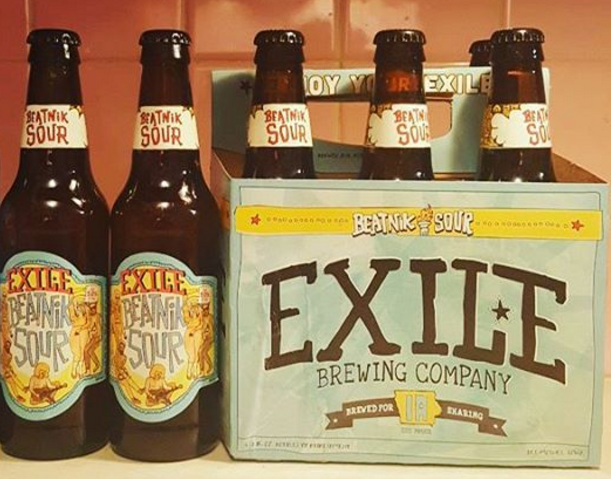 It seems to be one of the hottest styles that is present when it comes to microbrewery efforts and Des Moines, Iowa’s Exile Brewing is trying their hand at an easy drinking sessionable sort of tart beer with their Beatnik Sour. The beer pours with a light yellow to very light tan coloration and is full of flavors when an individual pours a glass. The Beatnik Sour has just enough in the way of a heart flavor to really refresh one’s palette after each sip. Beatnik Sour’s pucker is moderated nicely by a maltiness that presents itself at the end of each sip. Hints of grapes, citrus fruit, and bread can be picked out in subsequent sips. The effervescence of Exile’s Beatnik Sour is consistent from opening until the last quaff, giving imbibers considerable constancy with the brew. We’re a fan of Beatnik Sour’s versatility; it acts as a perfectly introductory sour for those not yet familiar with the style, while having a great enough depth for old hands. The beer is pegged at a sufficiently low alcohol content (5.6% ABV), meaning that it is incredibly easy to put down three or four beers over the course of a night. The great thing about Exile’s Beatnik Sour is that it has such a dense array of flavors that one will continue to find new nuances and idiosyncrasies each time that they open a 12 ounce bottle. For additional information about the brewery and their product line including the Beatnik Sour and other seasonal brews that they create, visit the Exile Brewing webpage. Further events and up-to-date information can be sourced from the brewery’s social media profiles.